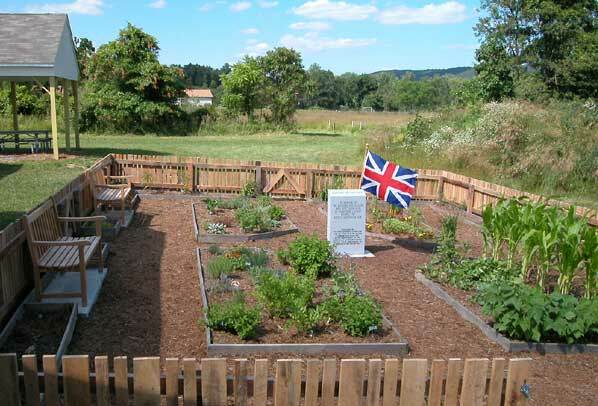 The Colonial Kitchen Garden at Fort Edwards was completed in 2004. The garden is located to the rear of – and on the northeast corner of – the visitors center. 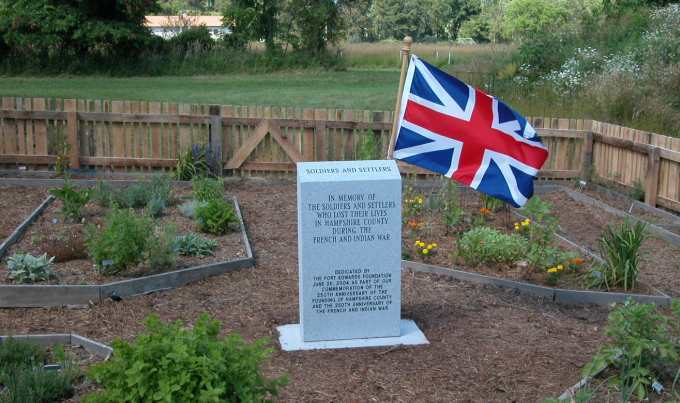 The striking centerpiece of the garden is a monument to the soldiers and settlers in Hampshire County who gave their lives during the French and Indian War. On the mulched walking paths of the garden are set two benches to provide quiet places to rest and contemplate the garden and the history and culture it represents. 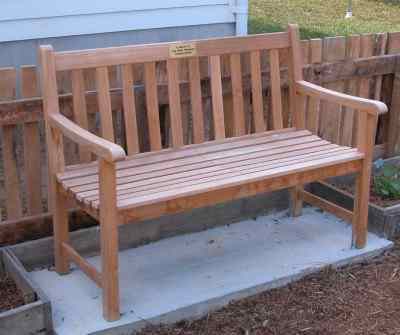 One of the two benches was dedicated to the memory of Lake Miller Henderson, a founding member of The Fort Edwards Foundation. The garden itself consists of four main beds and a surrounding border bed, all of this enclosed in a wooden protective fence with three entrance gates. All of the beds are raised above ground level, and the four main beds and the border each contain a different category of plants that would have been used in colonial homesteads. 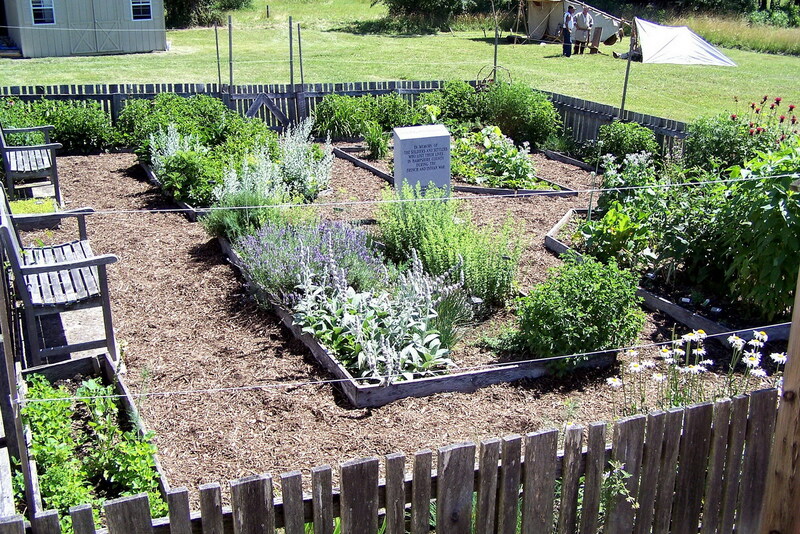 The four main beds are arranged as follows: in the northwest raised bed are planted medicinal herbs, used in the preparation of unguents and elixers, teas and various compounds to treat a variety of common illnesses and medical needs; the southwest raised bed contains culinary herbs and spices, plants that were used in cooking and seasoning foods (some of the same plants show up in both beds, as they were used in more than one capacity); the northeast raised bed is home to a variety of herbs used for dyeing cloth and preserving foods, and some pungent flowers used to protect plants from pests; and the southeast raised bed is a vegetable garden, containing ordinary foods the colonial settlers lived on. 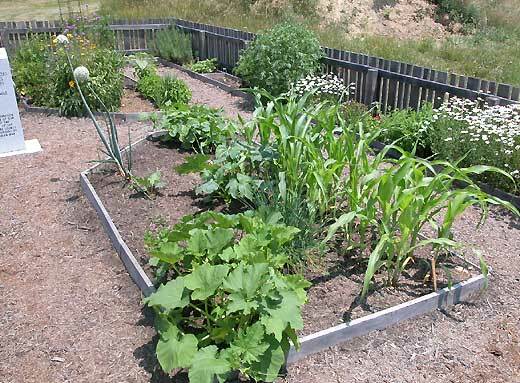 Around the outside of the garden runs an extended raised bed which contains a wide variety of plants, including wild flowers, more of some of the same herbs, gourds, pumpkins, and even two tobacco plants. In the future, this perimeter bed will be added to as additional "period" plants are obtained through donation and/or purchase. Come visit the Fort Edwards site, admire our new monument, sit on a bench and enjoy the aromas of mixed herbs and flowers, touch and smell rosemary, lavender, lemon balm, borage, comfrey, sage, basil. chives and house leeks. This latter curiosity is commonly called "hen and chicks," and bears a poignant tale of its importance in early times. In the 9th Century, Charlemagne decreed that "every house roof shall contain plantings of house leeks," (many of the roofs were of sod; otherwise, you just planted the house leeks up there anyhow) which were to prevent lightning strikes and to ward off evil. Our garden is not proportional; frontier families would have had much greater ground given over to the raising of food crops. But herbs and spice plants and other non-traditional garden plants were very important to settlers, and they would have cultivated them extensively.